The best way to get to know a community is by scheduling a tour. See the facilities, meet the staff and residents, and get a feel first hand what it's like to live at Eve Assisted Living Assisted Living. 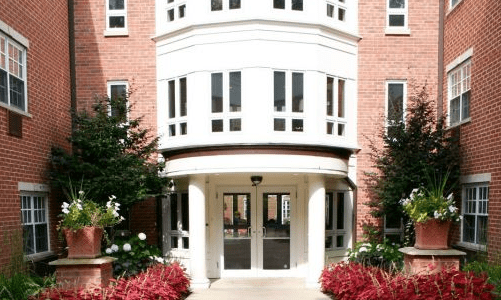 Nestled in the heart of historic downtown Hinsdale Eve Assisted Living offers first class modern facilities and compassionate care you or your loved ones deserve. We boast our historic architecture, tree lined streets and exclusive boutiques. At Eve, we aim to compliment your schedule. Our atmosphere goes beyond those offered by other communities; living at Eve encourages positive interaction, activity and health. Because we believe every person has been gifted with unique skills, preferences, abilities and personality we commit ourselves to learn, listen and assist you on your journey. Our community offers different floor plan for our living spaces. We have companion suites, one bedroom and two bedroom apartments that has designer window coverings, Italian granite for the kitchen and bath, personal control over your heating and air condition and full ADA accessible. We believe that the food we eat is a great factor in keeping our body healthy and away from sickness. We serve our residents nutritionally balanced meals and cat be adapted to special dietary needs of each residents. Our residents are provided with individually designed wellness plans. Our staff are onsite 24 hours and provides assistance in daily activities and medication management. Residents live a comfortable life and away from the chores that comes in keeping a home. We take care of the housekeeping, laundry service and maintenance. We have concierge and valet services that helps our residents with making appointments and parking.